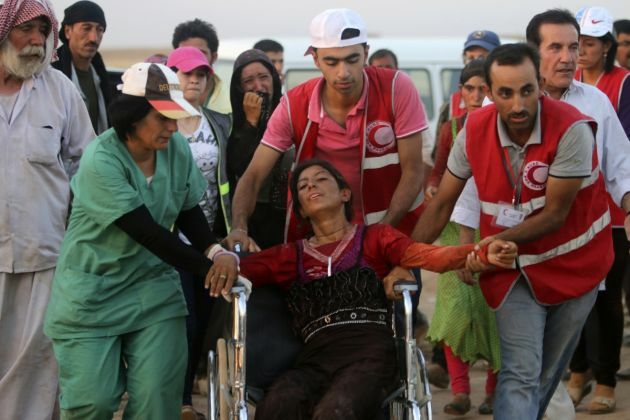 (Photo:)Members of the Kurdish Red Cresent help a displaced woman from the minority Yazidi group, fleeing violence from forces loyal to the Islamic State in Sinjar town, as they make their way towards the Syrian border, on the outskirts of Sinjar mountain, near the Syrian border town of Elierbeh of Al-Hasakah Governorate August 10, 2014. Islamic State militants have killed at least 500 members of Iraq's Yazidi ethnic minority during their offensive in the north, Iraq's human rights minister told Reuters on Sunday. The Islamic State, which has declared a caliphate in parts of Iraq and Syria, has prompted tens of thousands of Yazidis and Christians to flee for their lives during their push to within a 30-minute drive of the Kurdish regional capital Arbil. A leading Vatican diplomat has implored the United Nations to take action in the worsening humanitarian disaster that is the persecution of minorities in Iraq. Archbishop Silvano Tomasi, the Holy See's Permanent Observer to the U.N. in Geneva conveyed Pope Francis' appeal to the international community for action to stop the Islamic State from carrying out violent acts against minority groups in Iraq. In an interview with Vatican Radio, Tomasi said the Pope reiterated the call for action made by several groups like the World Council of Churches and the Organization of Islamic Conference. The groups have asked the U.N. to act on the worsening crisis. High officials from ancient Christian churches in the Near East issued a common statement Monday denouncing the emergence of armed extremist groups who "murder, shatter and violate the sacred nature of the churches" and other suffering Middle East communitiest. The church leaders called upon the international community, through action of the United Nations Security Council and the International Court of Justice, to restore the rights and homes of civilian populations and guarantee a return to land seized from them. The statement issued by the World Council of Churhes describes religious extremism as "a disease" that attacks the foundations of inter-religious coexistence throughout the region. The signers of the statement called on governments now supplying terrorists groups to cut off all funding and material support. "Evicting Christians from the town of Mossul and of other cities in the Ninive Valley, cannot be considered an ordinary emergency incident which goes down in the annals of wars and conflicts, or as a voluntary immigration because of the fear which affect persons who look for temporary and secure shelters to escape from death. "This inical decision taken by people in the name of Islam is a new disaster which hits the Arab-Moslem region and co-existence between its inhabitants. "After their eviction, the amed groups took everything away from them. It is a disgraceful act of racism which people reject and which international community condemns outright." In Geneva Breen Tahseen, an Iraqi diplomat whose father, Prince Tahseen Saeed Bek, is the leader of the Yazidi people, was to join leaders from the Iraqi Christian community at a rally Tuesday in Geneva. They are calling for the UN Human Rights Council to meet urgently on the destruction of minorities in Iraq. Organized by the Geneva-based non-governmental human rights group UN Watch, the rally called on U.N. rights chief Navi Pillay to take action to convene an urgent session of the 47-nation council on the IS atrocities in Iraq against minorities. UN Watch also arranged for the Yazidi and Christian leaders to meet with key diplomatic figures in the UNHRC system. Diplomats in Geneva have quietly discussed a special session, with the Vatican also pressing for action, but some prefer waiting several weeks until the regular session opens in the second week of September. "What seems to be particularly important in the letter of the Holy Father is the expressions that he uses: the tragic situation 'compels' the international community. There is a moral imperative, ... a necessity to act," Tomasi noted. The Vatican shared an excerpt of Pope Francis' letter to U.N. Secretary General Ban Ki-moon. In its Francis mentioned a number of actions that the U.N. could do in terms of its mandate and charter. "In renewing my urgent appeal to the international community to take action to end the humanitarian tragedy now underway, I encourage all the competent organs of the United Nations, in particular those responsible for security, peace, humanitarian law and assistance to refugees, to continue their efforts in accordance with the Preamble and relevant Articles of the United Nations Charter," Francis wrote. Tomasi said the prevailing threat on Christians as well as the Yazidis and Shiite Muslims by IS militants were having their basic human rights violated. This was enough ground for the body to "use force ... that is necessary to stop this evil and this tragedy." Islamic State extremists took over parts of northern Iraq in June in their bid to establish a caliphate there. It implemented a systematic drive to remove minority groups that refuse to convert to Islam. The exodus included people from different faiths such Christians, Yazidis and Shiite Muslims who disagree with the version of Islam the militants are spreading. Tomasi warned that the continued inaction of the body might lead to a repeat of the genocide in Rwanda to which he likened the ongoing crisis. He lamented that people's tendency to have a "short memory" more often led to similar incidents happening over and over again. The Vatican envoy recalled that diplomats met constantly during the Rwanda crisis, when ethnic Tutsis and Hutus killed each other, and issued "political declaration." But no concrete steps were taken to prevent the genocide from happening, he said. "And then, every year when we commemorate the almost one million people killed in that genocide, we make a kind of 'mea culpa' saying we have not done anything effective to prevent the killing of those innocent people," Tomasi said. "God forbid that this may also be the same situation today in northern Iraq."